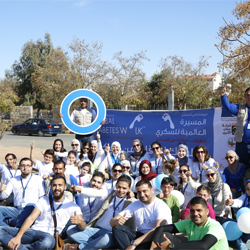 As part of the global initiative launched by the World Diabetes Foundation (WDF) to raise awareness about diabetes prevention, RHAS organized a diabetes awareness walk in partnership with Novartis Pharms, the Greater Amman Municipality, and the Jordan Diabetes Association, at King Hussein Park on Friday, November 17. Over 300 people attended the walk, entitled "Global Diabetes Walk,". This including staff and family members of the organizing parties, as well as beneficiaries of the Jordan Diabetes Association and RHAS healthy community clinics. The organized activities, which took place between 9am and 2pm, focused around three globally identified primary diabetes prevention methods, namely identification of risk factors, healthy food, and regular exercise. The program included blood glucose, blood pressure, and weight measurements.and screening of Abu Selim's diabetes awareness videos, amongst other activities. Participants received dietary guidance and an opportunity to listen firsthand to the experiences and recommendations of mothers of diabetic children regarding their children's diet. Not to mention the wide array of displays for measuring ideal food portions, and food alternative samples. Given the proven significance of regular exercise in preventing diabetes, the event aimed to highlight walking as the most basic, affordable, and accessible physical activity for everyone to. Additionally, participants engaged in various other exercises, such as basketball, jumping rope and more. “We are thrilled about our partnership with associations, organizations and the private sectors on organizing events to bring about positive change in the local community and raise awareness about the prevention of this chronic disease,” said Mrs. Hanin Odeh, Director General of RHAS. “Diabetes prevention is one of the society’s top priorities, especially when it comes to raising awareness about small behavioral changes that could be adopted to help individuals embrace healthier lifestyles,” she added. One such effort is the diabetes clinics initiative, launched in 2008, a year-long program helps individuals collectively in health centers to take measures to prevent the disease and to reduce the resulting disease complications interactively, while also focusing on the risk factors. The society worked in 50 primary and comprehensive health centers reaching 15,000 beneficiaries around the kingdom. As a result of this success and the proven impact of the program, RHAS collaborated with the Ministry of Health to expand the program to include a number of chronic diseases under the Healthy Community Clinics Program, which is implemented in 30 comprehensive health centers to-date. Diabetes is a chronic disease that occurs either when the pancreas does not produce enough insulin (a hormone that regulates blood sugar, or glucose), or when the body cannot effectively use the insulin it produces. Switching sugars to more complex carbs will not reduce your weight. Reducing the total amount will result in weight loss.